“Are you speaking to me?” asks a frightened youngster to the middle-aged man sitting across her in the tube-train in London. He has been looking in her direction for fifteen minutes now, but not at her. She frowns and hides behind the novel in her hand. He continues his speak. He is speaking animatedly of colonial imports and exports from Jakarta, Indonesia, and trade sea routes unacknowledged by historians of the imperial colonies. This man would be just another stranger going to work this ordinary morning, newspaper in hand if it weren’t for this little detail—that he is speaking to no one in particular with devoted attention. The row of commuters sitting along him and opposite him become increasingly on edge and shifty from behind their shields of books and tabloids. He would go on even when the train empties at the next station and I walk away feeling disturbed and unsettled by this incident. Consensus would conclude that such behavior is aberrant. He must obviously be insane. This man was having a “conversation” with the entire imagined people in the train coach, equally and unconditionally—a conversation where he was the only person he was talking with yet his thoughts were on offer to the “all” that he was not speaking to. It makes me think of expressions of soliloquies and the vulnerable face of human expression that it brings to the fore. The soliloquy is often used as a theatrical technique to give the audience insight into the actor’s thoughts while not being heard by the characters on stage. Imagine this theatrical trope trickling out of the stage and into everyday life where the listener is deposed and dis-positioned. The word ‘Selfie’ was declared the word of the year 2013 by Oxford dictionary. Self-timed photographs and selfies in the digital age seem be non-institutionalized familial descendants of the self-portraits of artists we are so familiar with, be it Van Gogh or Amrita Shergill or Pushpamala N in present times. Selfies also speak with the similar unconditional command of the soliloquy. You don’t wait for an audience—you are your own audience within your urgent condition. Confronted by a person who doesn’t care if you existed as their audience but at the same time whose being entirely depended on it, the listener is put into the most precarious of positions. We are taunted, dismissed, and captivated. We exist precisely through our absence in the speaker’s voice. In this moment of nakedness, no pretension, no protocol, no courtesy defends us from them—the soliloquists. Persona embodies this stubborn mind’s wrath—when one chooses to speak/ not/ listen/ not/ talk/ not/ exist/ not/ react/ not/ remember/ not/ forget/ not/ record. Woody Allen’s latest film Blue Jasmine (2013) poignantly and eerily hinges on the image of Jasmine speaking to herself in delirious states. Succumbing to a traumatic past, she is entangled in a mental time warp, a kind of seizure (allegorically in sync with the economic seizure of many countries at present) that rewinds, forwards and tries to change the course of events in the past mentally but is ultimately condemned to exist within a looped soliloquy. The stranger sitting on the park bench next to Jasmine silently gets up and walks away as the camera edges away too, leaving Jasmine staring infinitely across and beyond the camera. The silently clicked self-photograph is one small channel to this internal ebb—an acknowledgement of those modestly immodest times when you realize that ‘this’ right now, right here needs to be inscribed. You get over the inhibition of judgmental eyes and set your camera on a timer, find a suitably high ledge to place it on, and run back to position yourself within your inscription. The narrative is internalized. The listener is successfully made dispensable in the internal moment and pushed out into the every-one/no-one sphere, which is often social media—facebook/ Twitter/blog. This act gains strength in its willingness to reveal a weak moment in an increasingly singular world. Personal records get made by the second by this accumulative uploading of anonymous faces inscribed within their memorable moments. A vast tableau vivant emerges of rather vulnerable and helpless individuals battling their soliloquies where internal distances further away as physical distances collapse. Canon Self-timer – 10 seconds. Clicked at 3.17pm on Sunday, 24.11.13. Time to resume position – 6 seconds. Time to think – 4 seconds. 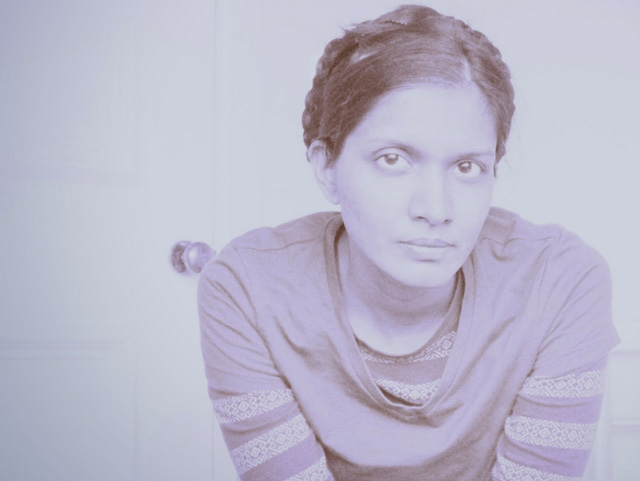 Srajana Kaikini is a writer, curator, researcher keen on mapping intersections of cross-cultural knowledge pools. She is currently exploring the spillovers between the spoken and written word, ways of reading and its implication in present day cultural practices. Srajana holds a Masters in Arts and Aesthetics from Jawaharlal Nehru University, New Delhi with a graduate degree in architecture. She is also a trained classical dancer of Odissi, and her passion for writing extends beyond academia into prose, poetry, cinema, and travel. Posted in by artists, content and tagged Autumn Sonata, Blue Jasmine, Ingmar Bergman, Ingrid Bergman, Liv Ullman, Persona, selfie, soliloquy, Srajana Kaikini, Woody Allen. Bookmark the permalink.